The word “hieroglyph” comes from the Greek hieros (sacred) and glyphos (words or signs) and was first used by Clement of Alexandria (c 150 – 230 A.D.). The ancient Egyptians called them ‘mdju netjer or “words of the gods.” The first known example of hieroglyphic writing in ancient Egypt was discovered on bone and ivory tags, pottery vessels and clay seal impressions discovered in a pre-dynastic tomb in Abydos. The deposits are dated to between 3400 and 3200 B.C. The last example is from the temple of Philae, and is dated to 394 A.D. 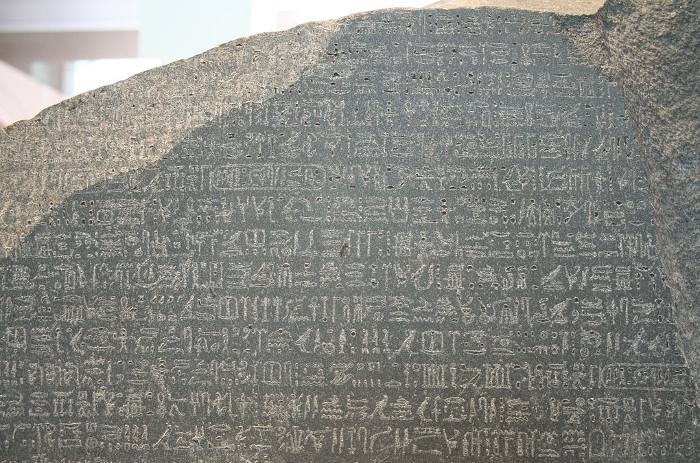 Knowledge of the hieroglyphic script was lost until the early 19th century, when Jean-Francois Champollion (1790-1832) used the Rosetta Stone to decipher the script. We know little about the early development of Egyptian hieroglyphs. 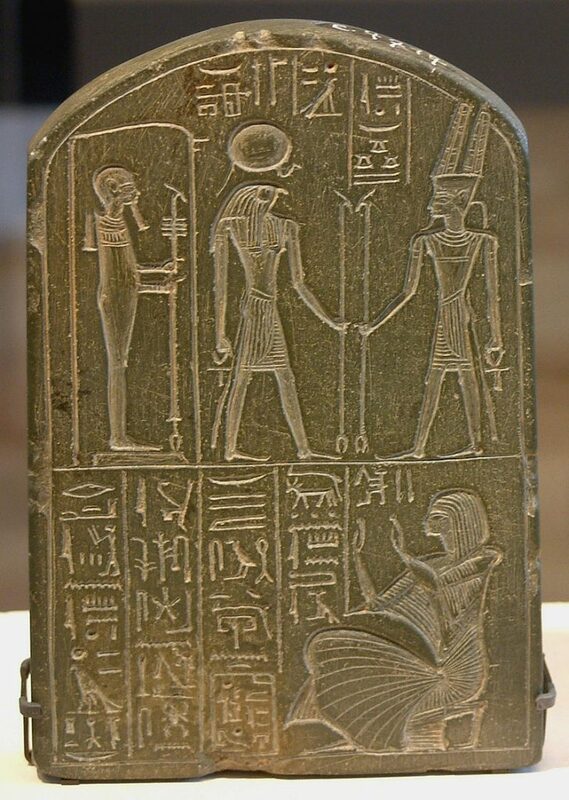 The early signs found in Abydos (left) already include short phrases and no earlier signs have been discovered. It is possible there was only a short developmental phase before the emergence of the fully fledged language, but some have used the lack of information to argue that the Ancient Egyptians learned writing from a lost civilisation or aliens. More reasonable scholars suggest that the ancient Egyptians borrowed the idea of writing (but not the form) from Mesopotamia. However, inscriptions dating from the reign of King Scorpion (roughly 3400 B.C.) have led many to suggest that Egyptian hieroglyphs may have preceded the Mesopotamian scripts. The Mesopotamian writing system developed over a long period of time. Logograms (where a picture represents a word) were developed as early as 8000 B.C. but a recognisable system of logograms and phonetic script did not develop until about 3200 – 3100 B.C. However, the early hieroglyphic script found in Abydos already included short phrases (although we cannot completely translate their meaning), and so is comparatively developed. The first symbols that represent recognisable hieroglyphic signs appear on early pottery (for example, the zigzag lines depicting water) and many of the standards and conventions of the fully developed script are already in evidence on the Narmer palette. While there is clear evolution between this early writing and the fully formed hieroglyphics of the fifth dynasty pyramid texts, there is no evidence of an earlier stage of development. A direct link between the Mesopotamian script and hieroglyphics is unlikely due to the differences in the written language, however it is possible that the Egyptians simply decided to develop their own system when they saw how useful the invention was. 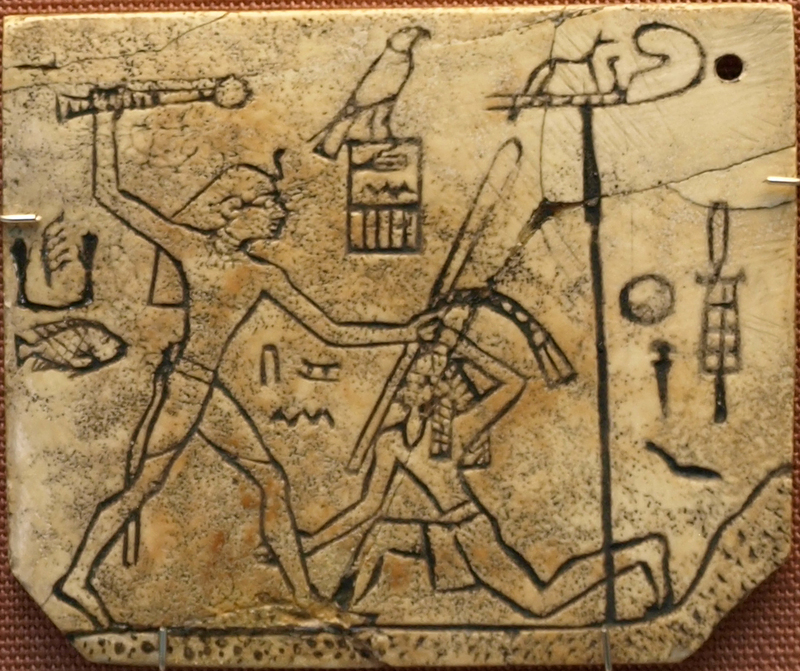 There is some evidence of a Mesopotamian influence on pre-dynastic Egyptian culture (such as the use of cylindrical seals and the mythical beast depicted on the Narmer palette), but no evidence of an Egyptian influence in Mesopotamia at that time. It is also possible that the development of each script was relatively independent and that it was the increase in trade and the growth of stable settlements which prompted the development of each script. Hieroglyphs are time consuming to produce and require a great deal of skill and knowledge, so it is only in the early period that we find hieroglyphs written on every type of material and for every purpose. By the first dynasty (around 2900 B.C.) the Egyptians had developed a simplified cursive script known as “hieratic”. The script was based on hieroglyphics, but the signs were greatly simplified and so better suited to writing on papyrus. Hieroglyphs continued to be used on religious and monumental architecture, but hieratic took over for religious texts on papyrus and record-keeping. During the 7th century B.C. the Egyptians began using “demotic” (which was even more simplified cursive script than hieratic) for business and literary texts. During the Ptolemaic period (305-30 B.C.) Egypt was ruled by a Greek dynasty descended from Ptolemy (Alexander the Great’s general). The early part of the dynasty saw a renewal of Egyptian civilisation as Alexandria became the only city in the ancient world to rival the power and glory of Rome. The Great Library was constructed by Ptolemy I in part because he believed at heart that Greek culture was the greatest in the world and he wished to infuse Egyptian culture with Greek ideals. This mixing of cultures resulted in the development of many new hieroglyphic signs as the priests explored the mysterious and complex language, often creating complex codes and puns whose meaning was known only to a select few. However, the dynasty remained unpopular with more traditional Egyptians (after all they were still Greek), and by 206 B.C. Upper Egypt was in open rebellion. As the power of the dynasty waned, they increasingly relied upon Rome to maintain control of the country. This strategy worked reasonably well, until Cleopatra pushed her luck and Egypt was invaded by Octavian (Emperor Augustus) in 30 B.C. Roman rule was very harsh. The greedy Romans applied high tax rates and allowed Egypt less autonomy than the other provinces. Then in 391 A.D. the Emperor Theodosius ordered that all pagan temples must close. This essentially destroyed the hieroglyphic language (which by that time was only used on monumental architecture and in temples). The last firmly datable hieroglyphic inscription was written in A.D. 394.